For Father’s Day, a sort of reverse father-son golf story about me and my dad, who didn’t start playing until after I did and didn’t let a bad back stop him. 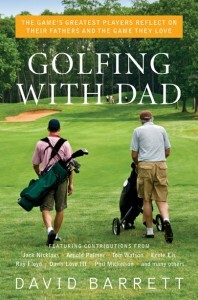 This is the introduction to my book Golfing With Dad about Tour pros and their fathers. 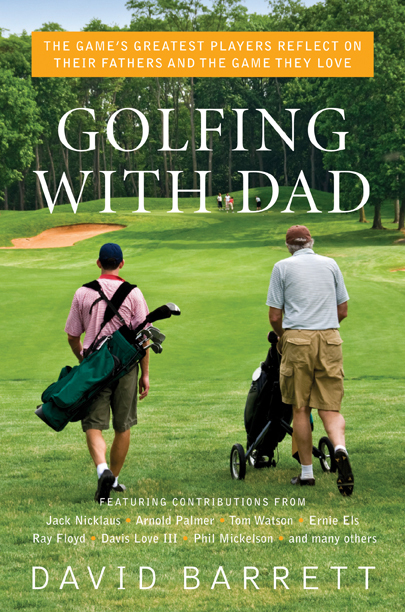 This book tells the stories of fourteen tour pros and their fathers, and how golf shaped and influenced their relationship. I am decidedly not a tour pro, and not even a low handicapper though I did once get down to single digits for four weeks. My late father—Dave Sr.—didn’t play golf when I was growing up. Yet our golf story is, in its own way, pretty compelling. There are two reasons my dad didn’t play golf until he was nearly forty years old. First, he wasn’t exposed to the game when he was growing up. Second, he had a bad back. A really bad back. The problems started in his early twenties and involved separate injuries or ailments in his lower, middle, and upper back. The twisting and turning of a golf swing were out of the question. Or so it seemed. So, I wasn’t exposed to golf either. But I loved sports, as both a fan and a participant. From the ages of six to twelve, I practically lived and breathed baseball, while finding plenty of time for basketball and football, too. When I was twelve, I began to be intrigued by golf. My cousin Rich wanted to learn to play—his dad was an occasional weekend golfer. We didn’t really have anybody to teach us, so we learned on our own by hitting plastic balls in his backyard. One thing that enriched the golf scene in those days was an abundance of pitch-and-putt courses where kids could be introduced to the game (sadly lacking in most places today). For our first golf outing, my mom dropped us off at a pitch-and-putt. We brought our entire sets of clubs with us—my dad had bought me a used set. Rich pulled out his driver on the 100-yard first hole. “Great shot!” I enthused as his ball took off straight, a low line drive that landed short of the green—and proceeded to roll about forty yards past it. I soon graduated to a regular course for my first round at age twelve. By the time I was fourteen, my summer was filled with golf. My next-door neighbor Paul and I spent several days a week at the Plainfield West Nine in New Jersey. This was a public course owned by and across the street from the renowned Plainfield Country Club. The West Nine was a poorer cousin, a nine-hole, 2,500-yard, par-33 public course with a modest green fee—in short, a perfect place for two young kids to play. It wasn’t crowded, so playing as a twosome we typically tooled around for 45 or 54 holes. The first 18 was pretty much just warming up. Like many New England golf courses. As I got older, my small size caught up to me in other sports. I went from a Little League star to a Pony League mediocrity and didn’t make the ninth-grade basketball team. I was a co-captain of the freshman soccer team—but before tenth grade we moved to Durham, North Carolina, where at the time (1971) there was no high school soccer. I was left with just golf and threw myself into it with a passion. I was a serviceable No. 4 player on a pretty good high school golf team and became a fanatic follower of the PGA Tour. My parents and I watched the tournaments on television every week and my friend Sam and I pored over each week’s issue of Golf World to see who made it through Monday qualifying—we were even more fascinated with the tour’s “rabbits” than we were with the stars. My father saw my enthusiasm for golf. When I was fifteen, he gave me the best Christmas present I ever got—a new set of golf clubs that was absolutely a complete surprise. By the time my high school years were nearing their end, his interest in the game had been thoroughly piqued by all the golf talk and golf watching. Instead of the son being brought into the game by the father, it was the other way around. But there was the matter of dad’s back problems. He could only manage a half backswing and his golf aspirations didn’t extend beyond pitch-and-putt. Neither of us dreamed that he would do anything more than that. In fact, I wasn’t sure that he would stick with it for very long. Dad had a long history of hobbies that he pursued intensely for a few months before dropping them and moving on to the next one. There was short-wave radio, harmonica playing, air-pistol shooting, calligraphy, and more. We played a few pitch-and-putt rounds, and thoroughly enjoyed them, before I headed away to college. Dad’s interest in golf only grew. He found a driving-range teacher who was willing to work within his physical limitations to improve his ability to hit the ball. Over the course of a series of lessons and other practice sessions at the range, he began to hit the ball farther and became comfortable with hitting all the clubs. When I came home the next summer, dad was ready to play on a regulation course. He had to wear a back brace, and his backswing was still not all that much more than halfway. He couldn’t reach any of the par fours in two shots or par fives in three. He looked a little funny with his abbreviated swing, but he was not embarrassed. Nor should he have been. He hit the ball straight, was pretty good around the greens, and shot not too much over 100. I’m sure he was proud just to be able to play on a full-length golf course. And I was proud of him, too, in a sort of reverse father-son way. But dad didn’t stop there. The lessons continued and his game progressed. During the next couple of summers we played pretty often. Dad was now shooting in the 90s on a fairly short but regulation course. I noticed something odd about my behavior when I played with him. For some reason, I began to display anger after bad shots. I don’t recall flinging any clubs, but there were definitely tantrums. What’s odd is that I’m a calm person and didn’t act that way when I played with others. My amateur analysis is that I must have wanted him to think of me as a good golfer. I wanted to show that I felt I shouldn’t be hitting those bad shots—therefore, I must be a good golfer. Or something like that. In any case, he never said anything about it, nor did it detract from his enjoyment of the game, which was palpable. Dad began to play with a couple of friends from work. By now, he was hitting the ball far enough to be capable of reaching greens in regulation. He had gained enough flexibility that his swing expanded to three-quarters, and he could fit in with golfers who had been playing the game for a long time. I got a sports writing job in Virginia for a year and then moved on to the Augusta Chronicle in Augusta, Georgia. Living out of town, I didn’t get to play with dad that often. But I followed his progress from a distance. As a testament to his further development, he began to play at Duke University Golf Course, a longer, hillier course designed by Robert Trent Jones. He joined the Duke Men’s Golf Association. He enjoyed going out by himself after work and being paired with whatever strangers happened to be about to go off the first tee. He was a real golfer now, a pretty good one, as I was about to find out first-hand. On one occasion when my mom and dad visited Augusta three or four years after I got out of college, we played a round at Forest Hills Golf Course, a public layout that is the home course of Augusta State University and was designed by Donald Ross. My dad usually walked when he played, pulling a cart, but this time my mom, Virginia, came along to watch and rode in a cart with him. Forest Hills is a tight, tree-lined course that measured about 6,300 yards from the regular tees. Dad had one of his best rounds, shooting, I recall, something like an 86. I didn’t play particularly well, but it wasn’t a terrible round by any means. I think I shot an 88. This is where our story intersects with many of those in the book, albeit from an opposite perspective. It’s a common theme of the child golfer improving by stages and finally reaching the point where they beat their father for the first time. Only for us, it was father beating the son. Dad was keeping a scorecard, but he was a “one-hole-at-a-time” kind of guy who probably was unaware of our cumulative scores. We never had a match going, or anything like that. It wasn’t part of our golf dynamic. I always keep my own score in my head—no scorecard needed. I knew dad was playing great, so I probably checked his card at some point late in the round and knew he had a chance to beat me. Dad finished the round strong. He may not have known the score, but in any case he didn’t give me any opening to catch him. When he added up the numbers on the card, he saw that his score was lower than mine. He acted a little bit sheepish about it, like he thought I wouldn’t be happy. In truth, I’ve never been happier to be beaten on the golf course. His play that day, and his progress in the game, filled me with pride—and still does. When my father first picked up a club, I couldn’t imagine him ever being able to hit a golf ball more than 100 yards. I’m not sure he could imagine it, either. But through sheer determination he became a golfer capable of shooting in the mid-80s on a good golf course. That’s inspirational. And that was my dad. Lovely tribute to the old man. I still have my dad’s old putter.